Veterans Day is this weekend on Sunday, November 11. Our national holiday honors all those who have served in the United States Armed Forces and thanks them for their service and sacrifice. 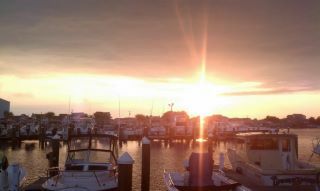 Are you wondering what the Crystal Coast has planned for this holiday weekend? We can help you with that. Locally, Morehead City holds its annual Veterans Day parade on Saturday, November 10 at 11a.m. It's a big event that draws crowds to line Arendell Street in participation and support of our veterans. We hope to see you there! 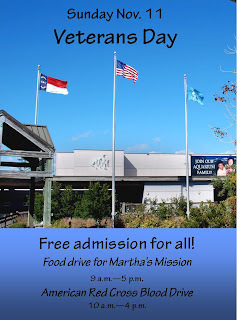 On Sunday, November 11, the North Carolina Aquarium at Pine Knoll Shores offers free admission to all (no past or present military affiliation required) in honor of Veterans Day. The aquarium is open from 9a.m. to 5p.m. and as always has a host of fun and free activities which include two touch pools, dive presentations, animal programs, and so much more. Take advantage of the free admission, but also take advantage of the two opportunities available to visitors to support and give back to the community. Collections for Martha's Mission Cupboard in Morehead City are being taken this day, so bring non-perishable food donations with you when you come. Staples such as cereal, peanut butter, powdered milk, canned fruit and vegetables, dried beans, rice, and crackers are in demand. This local food pantry helps families on the Crystal Coast during difficult times throughout the year. With the holiday season coming up, they are especially in need of donations during this time. Also, please be sure the items have not passed their expiration date. Collection boxes are available or you can just hand your donations to an aquarium staff member between 9a.m-5p.m. The American Red Cross is on hand in Soundside Hall from 10a.m.-4p.m. so roll up your sleeve and give if you can. This precious commodity is in need of replenishing and any donations are greatly appreciated. Neither of the donations are required for the free admission to the aquarium, but we do hope you'll give if you're able. Thank you in advance for your support! If you're visiting the coast this weekend, don't forget that there are some nice seasonal discounts on beach vacation rentals. Be here for the holiday weekend, and extend your stay for the week! We thank all those who give on a daily basis and serve our country, past and present. Remember to take a moment and thank a veteran; not only on Veterans Day, but on any day that you have the opportunity.